Harold Bingham Lee (March 28, 1899 – December 26, 1973) was an American religious leader and educator who served as the 11th president of The Church of Jesus Christ of Latter-day Saints (LDS Church) from July 1972 until his death in December 1973. Lee was born in Clifton, Idaho to Samuel Lee and Louisa Emeline Bingham and was the second of six children. The Lee family lived the rural life and Lee and his siblings spent most of their youth doing farm chores. During his childhood, his mother saved him from several near-death experiences. When he was eight, he was sent to get a can of lye from the shelf and spilled the deadly product all over himself. His mother opened a vat of pickled beets and poured cup after cup of the red vinegar all over him, which neutralized the lye. When Harold was a teen, he punctured an artery on a broken bottle. His mother cleaned it, but it became badly infected. She burned a black stocking to ashes and rubbed it in the open wound and it soon healed. Lee was fortunate to receive a good education. He finished eighth grade at a grammar school in Clifton and his parents allowed him to continue his education at Oneida Stake Academy in Preston, Idaho. The first few years, Lee focused on music and played the alto, French, and baritone horns. Later, he played basketball and was a reporter for the school newspaper. He graduated in the spring of 1916. The summer following his graduation Lee worked to receive his teaching certificate from Albion State Normal School at Albion, Idaho. After two summers of study in 1916 and 1917, Lee passed the state's fifteen-subject test to receive his second- and third-class certificates. Lee held his first teaching position in the fall of 1916. He taught a class of 25 students, grades one to eight, in Weston, Idaho. His salary was $60 a month. When he was eighteen, he became principal of a school in Oxford, Idaho. In September 1920, then church president Heber J. Grant called Lee on a mission to the western states, with headquarters in Denver, Colorado. He was twenty-one and served until December 1922. While on his mission, Lee met a sister missionary from Utah, Fern Lucinda Tanner. They renewed their acquaintance when they returned from their missions and were married on November 14, 1923 in the Salt Lake Temple. Fern died in 1962 and on June 17, 1963 Lee married Freda Joan Jensen, a former mission companion's girlfriend who had never married. She died on July 1, 1981. In 1932, at the age of thirty-three, Lee became a community leader when he was appointed to fill a vacancy in the Salt Lake City Commission. He was assigned to direct the Department of Streets and Public Improvements. A year later his political career was launched when he was elected to the same position. In 1930, Lee was called as president of the LDS Church's Pioneer Stake in Salt Lake City. He became the youngest stake president in the church, at that time, when he was set apart. The 1929 Great Depression in the United States left more than half of its members without jobs. He established a welfare program to aid members in distress that became a model emulated by the entire LDS Church. As part of the program, he helped organize the Pioneer Stake bishop's storehouse in 1932. The storehouse provided members with basic food necessities. Bishop's storehouses remain part of the church's welfare program today. In 1936, Lee became managing director of the Church Welfare Program. Although he also pursued a political career, he began full-time church service when he was called to the Quorum of the Twelve Apostles in 1941. Lee served on a committee to streamline church organization and functions. For two decades Lee studied the subject and prepared proposals. Lee was the chairman of thePriesthood Correlation Committee under LDS Church president David O. McKay. The committee restructured church organization in the 1960s, including labeling the children's and women's organizations as auxiliary to the priesthood organization. According to some historians, Hugh B. Brown petitioned McKay to rescind the policy of excluding people of African ancestry from the priesthood. However, McKay had not felt spiritual impressions that the time was right to do so. Historians observe that Brown continued to seek to reverse the ban "administratively", but Lee was among those who noted that it was a matter of God making his will known through revelation. In December 1969, Lee initiated a release to church leaders, signed by Brown and N. Eldon Tanner, both serving as counselors in the First Presidency, a statement that supported equal opportunities for civil rights, and that indicated priesthood policy would not change until God revealed it through revelation. When McKay died in 1970, Joseph Fielding Smith became church president and Lee was called as First Counselor in the First Presidency. He continued to gain practical experience for what was expected to be a long presidency of his own, given the fact that he was twenty-four years younger than Smith. In 1972, Smith died and Lee became the church's president. Later that year, he organized the Jerusalem Branch and presided over the church's second area conference, held in Mexico. Lee's presidency proved one of the briefest in the history of the church, lasting from July 7, 1972 to Lee's sudden death due to a fatal pulmonary hemorrhage on December 26, 1973 at age 74. Lee was buried at Salt Lake City Cemetery. The main library at Brigham Young University was named in Lee's honor after his death. After his death, a statue of Lee was dedicated at his birthplace. Brigham Young University also honored the former church president by renaming its library after him. 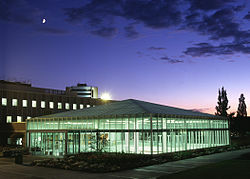 The 665,000-square-foot (61,800 m2) Harold B. Lee Library is one of the largest libraries in the western United States and contains 98 miles (158 km) of shelving. Lee's teachings as an apostle were the 2002 course of study in the LDS Church's Sunday Relief Society and Melchizedek priesthood classes. Lee, Harold B. (1945). Youth and the Church (retitled Decisions for Successful Living). Deseret News. —— (1974). Stand Ye in Holy Places: Selected Sermons and Writings of President Harold B. Lee. Deseret Book. —— (1974). Ye Are the Light of the World: Selected Sermons and Writings of President Harold B. Lee. Deseret Book. —— (1996). Clyde J. Williams (ed.). Teachings of Harold B. Lee, Eleventh President of the Church of Jesus Christ of Latter-day Saints. Bookcraft. —— (2000). Teachings of Presidents of the Church: Harold B. Lee. The Church of Jesus Christ of Latter-day Saints. LDS Church publication number 35892. ^ Gibbons 1993, pp. 18; 13. ^ a b c d e f Church Educational System (2005). "Chapter 11: Harold B. Lee, Eleventh President of the Church". Presidents of the Church: Student Manual. LDS Church. Archived from the original on 22 October 2014. ^ Payne, Jaynann Morgan (February 1974). "Louisa Bingham Lee". Ensign. ^ a b c d "Utah History Encyclopedia". www.uen.org. Archived from the original on 2015-10-21. Retrieved 2016-04-12. ^ a b c Prince, Gregory A.; Wright, William Robert (2005-01-01). David O. McKay and the Rise of Modern Mormonism. University of Utah Press. ISBN 9780874808223. ^ Bingham, Kelly. "Harold B. Lee's Grave - Graves of the LDS Church Prophets". Moroni's Latter-day Saints Page. ^ "Teachings of Presidents of the Church: Harold B. Lee". www.lds.org. The Church of Jesus Christ of Latter-day Saints. Retrieved 19 December 2018. Gibbons, Francis M. (1993). Harold B. Lee: Man of Vision, Prophet of God. Salt Lake City, UT: Deseret Book. ISBN 0875797164.